We have been improving our Knowledge Base over the past month, adding features that are often requested. This post explains those updates in detail. We are also working on an embeddable version of the Knowledge Base (KB) which will be released soon. A common feature request from a lot of the customers has been the ability to password protect the KB, which has important product information. The idea is to keep sensitive information away from competitors and make it available only to customers for whom it is relevant. Please visit KB > Access Settings and turn on the ‘Password protect this KB’ option to enable authentication. You can share the provided password with your customers for accessing the KB. You can now add a contact form to your KB site by enabling it from your SupportBee account. Please visit KB > Contact Settings to enable that integration. 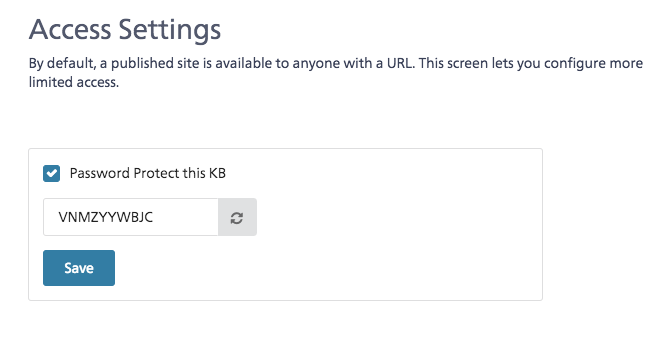 If you use Google Analytics (GA) for tracking website traffic data, you can add the tracking code to your KB site published through SupportBee. Please visit KB > Site Settings to add the tracking code.